Subject: Implementation of Revised Escalation Matrix of calls received at Kisan Call Centres and not answered by Farm Tele Advisors (FTA). A State Level Designated Officer (SLDO) will create User Ids for various specializations/locations of the State/District level. To start with, the State Nodal Officer of the Kisan Call Centres shall be the SLDO for Agriculture sector at the State level. These designated officers can login at URL www.dackkms.gov.in with their e-mail ID sent to us. Password corresponding to this e-mail ID has been sent by e-mail. Password needs to be changed on the first login. After logging in, SLDO Agriculture will create State Level Designated Officers (SLDOs) in other three sectors (horticulture, animal husbandry and fishery). Thereafter the SLDOs will create District Level Designated Officers (DLDOs) in their respective sectors. Besides this, SLDOs will also create users at State level in such a way that all specializations as listed in the software by way of a multi check box are covered by a set of officers. 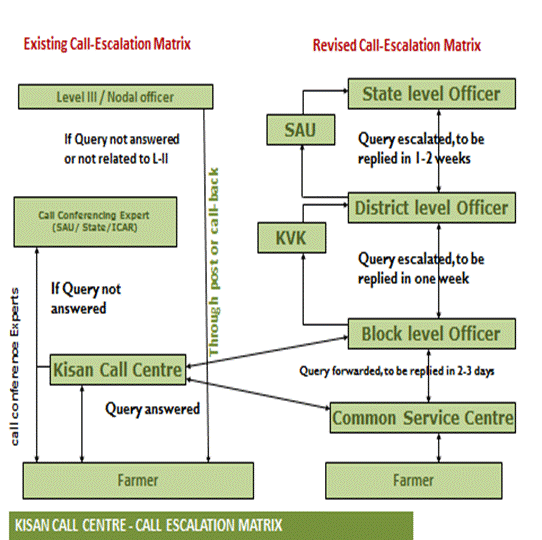 Since Level II of the escalation after Kisan Call Centre starts at the Block Level, it is necessary to create at least one user in every Block for each Department. This task needs to be decentralized at the District level by identifying one officer in each sector at the District level. Such Officers District Level Designated Officers (DLDOs) in every district will need to be enabled by SLDOs as described above using the appropriate check box. The farmers can also visit Common Service Centre (CSC) to get the answer to their queries. The CSCs may either answer the query by accessing relevant websites or escalate the same to higher levels as in case of KCC. The CSCs can also upload photographs along with description of the problem if the farmer comes with specimens of affected crops. A login interface has already been provided under the KCC Portal (www.dackkms.gov.in). Queries registered at the CSCs will also go through the same escalation matrix. The database of farmers’ queries given at CSC will also be available at KCC and vice versa. 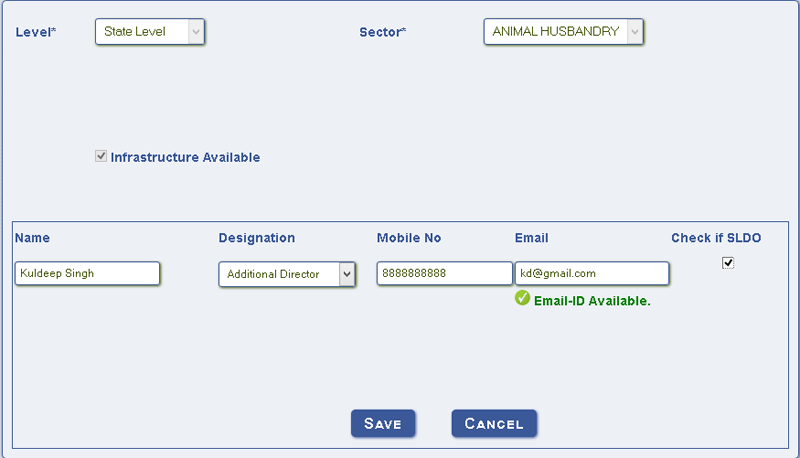 Thus, a KCC agent can convey solution to a CSC query by making an outbound call to the farmer. As already decided with CSC, SPV and also communicated vide this office letter No.Z-11018/12/2013-IT dated February 19, 2014, the Village Level Entrepreneur (VLE), a CSC may charge Rs.3 for recording of query, uploading of image of plant material (captured through webcam) or its picture, escalation of query without answering and registration of farmers for SMS service and printing of acknowledgement. However, in case the query is also answered by the VLE, he may charge Rs.5 instead of Rs.3. In case of escalated queries of the answer received from the expert is subsequently provided to the farmer by the VLE, he may charge a sum of Rs. 2 from the farmer. Apart from this, VLE may also charge additional Rs. 2 per page for printing of any material/literature other than the acknowledgement. 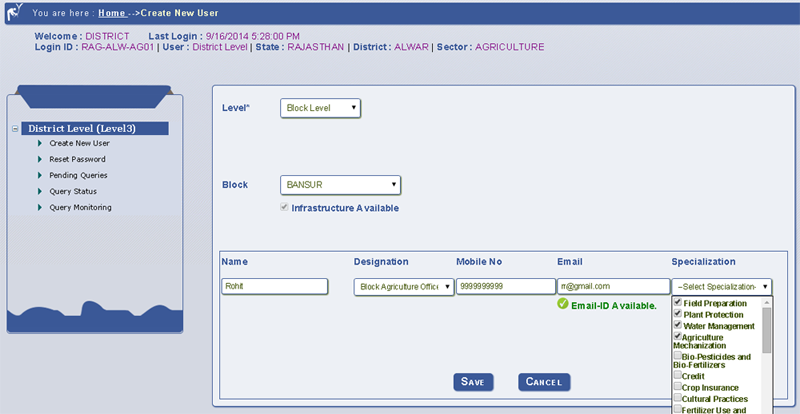 There may be some Blocks where either IT infrastructure or broadband connectivity may not be available, such Blocks need not be assigned codes as of now and queries in such cases will get directly escalated to the District level. MIS reports and query options have been provided for viewing the status of escalated queries at different levels and also answers posted by concerned officers. The high level officers may, therefore, keep a track of answers given at lower level to get the erroneous answers (if any) rectified or there may be suitably advised. It is requested that the revised escalation matrix may kindly be got implemented at the earliest to provide reliable and accurate answers to the farmers on the problems and queries raised by them. Annexure II : User manual for creation of user IDs at State/District/Block Level for implementing revised KCC Call Escalation Matrix. After login, Click on “Create New User” option and then after select Level, Sector and Click Add New Button. Now Enter User Name, Select Designation, Enter Mobile No, Enter Email-Id, Check SLDO status in the check box and Click Save button. Step 3. 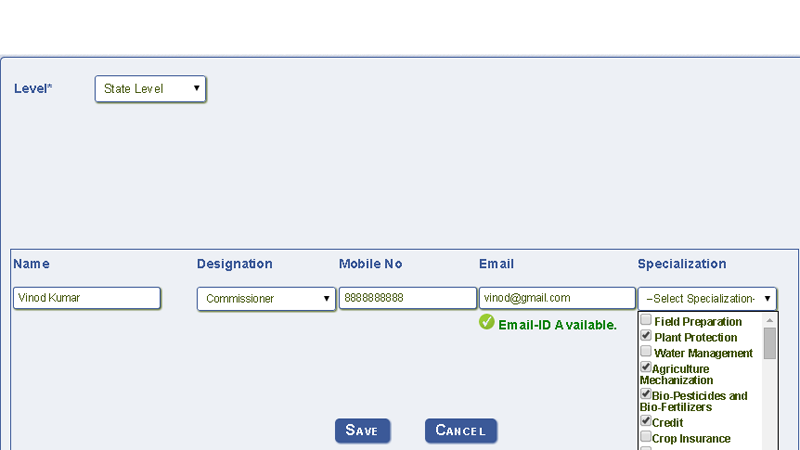 Creation of User IDs for State Level Officers by SLDOs in their respective sector: The SLDOs will create user IDs for Officers at State Level and SAU Level in such a way that all specialization as listed in the dropdown are covered. After login click on Create New User, select Level and click on Add New button. After login click on Create New User, select Level, select District and click on Add New button. Step 5. Creation of User IDs for Block Level Officers by DLDO. Step 6. Creation of User IDs for Krishi Vigyan Kendra (KVK) by Zonal Project Director (ZPD). User IDs for ZPDs shall be created centrally and their password shall be sent to them over email. The ZPDs shall be able to Login using this email and password. After login ZPDs shall be able to create KVK users with in his zone.